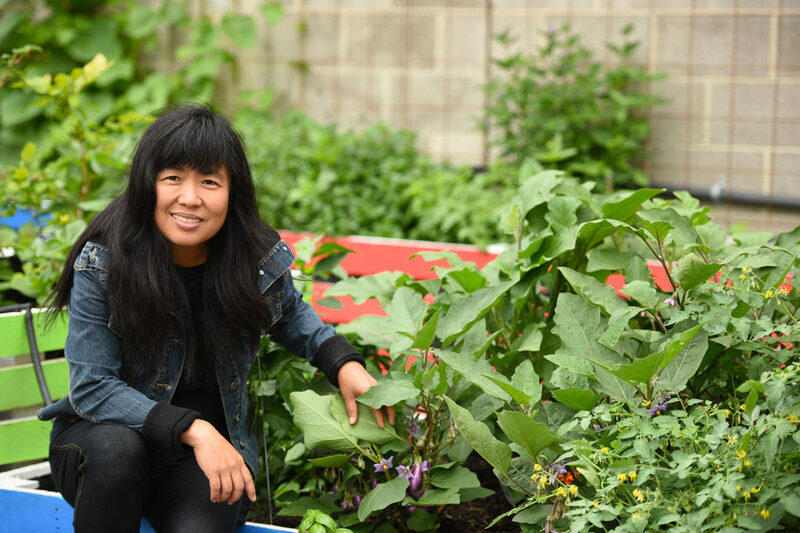 With fresh fruit and vegetables hard to come by in some of the city’s soup kitchens, Meei Ling Ng plants gardens to provide hyper-local produce to the homeless. The soup kitchen volunteers have always prepared for the weekly Friday luncheon by shopping for and cooking food in an industrial kitchen in the church’s basement, adjacent to a dining room with cloth-covered tables, where people from nearby shelters are welcome to enjoy a free, nutritious meal. And for the past year, sourcing fresh vegetables—often a big challenge for the church—has been easy. The soup kitchen’s pantry is now supplemented by hyper-local produce, harvested the same day from a new garden in a previously underused plot next door to the church. Ng planted an unusual variety of crops that include black heirloom tomatoes, rainbow chard, summer squash, purple cauliflower, Asian pears, and almonds, all cultivated in raised beds and in an orchard along the church’s perimeter. In a way, she has replicated the model of her childhood home on a five-acre orchid farm in Singapore, where her family self-sustained all of its produce needs. “We had rows and rows of vegetables and fruit trees everywhere,” Ng recalls. “I grew up in that kind of environment. Everything we picked we ate fresh.” Having lived in Philadelphia for more than two decades, Ng is undeterred by her current home’s urban density in finding places to grow food. As a working artist, Ng considers the UBC Garden of Eden to be an extension of her multimedia installation sculptures, many of which are food- and farm-themed. 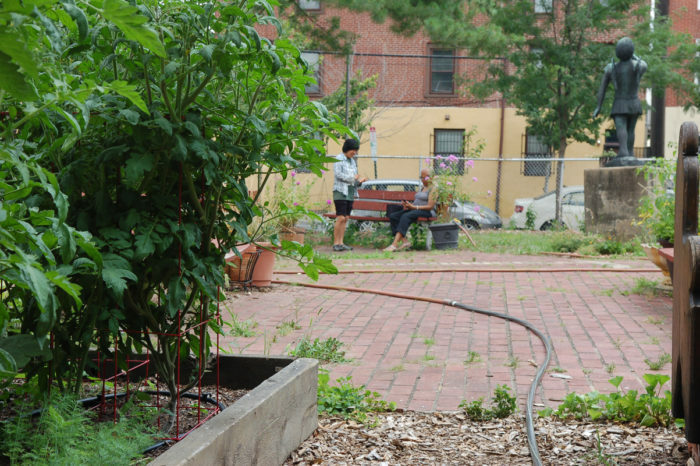 Some of her past works in Philadelphia include a musical garden at SpArc Services and the Deep Roots series of installations at two of the city’s urban farms. The UBC Garden of Eden is the second of her spontaneously developed hunger-relief urban farms; the first such project was at Sunday Breakfast Rescue Mission, Philadelphia’s largest homeless emergency shelter. There, a string of raised beds along the edge of the mission’s parking lot have provided the high-volume kitchen with fresh vegetables (such as tomatoes, salad greens, and fresh herbs) since 2015, as well as farming instruction for those overcoming homelessness. Sourcing fresh produce—and staying within budget—is a challenge for many soup kitchens. Individual donations of perishable items are rare, so some organizations choose to work with hunger-relief nonprofits that have the logistical capability to glean fruit and vegetable gifts directly from local farmers. The Philadelphia Orchard Project, which contributed fig, almond, and Asian pear trees to the UBC Garden of Eden this year, has a fruit gleaning program. Philabundance, another local nonprofit, is known by Philadelphia-area farmers as a way to keep excess or less cosmetically attractive produce from going to waste. Distribution of this donated produce requires complex transportation, however, and so soup kitchens must often meet certain volume criteria in order to receive deliveries. Philabundance, for example, requires that its soup-kitchen member agencies serve at least 500 monthly meals in order to qualify. For smaller-scale operations that don’t reach that number, such as UBC’s soup kitchen (which has fed around 70-80 people per week in previous years and feeds between 20-30 each week now), this usually means they have to purchase produce themselves or rely on non-perishable items. “Produce is hard to come by [for] smaller operations, and [direct] donations of produce [by farmers] could have a major impact,” says Scott Smith, director of food acquisition at Philabundance. As an added benefit, Ng’s farms engage their surrounding urban communities and teach city dwellers that even figs can grow on a city block. An herb garden can flourish in a parking lot, and heirloom tomatoes can thrive in a raised bed built out of salvage materials from the demolition of a nearby growhouse. Bravo! what a fine example of community moving in a sustainable direction. 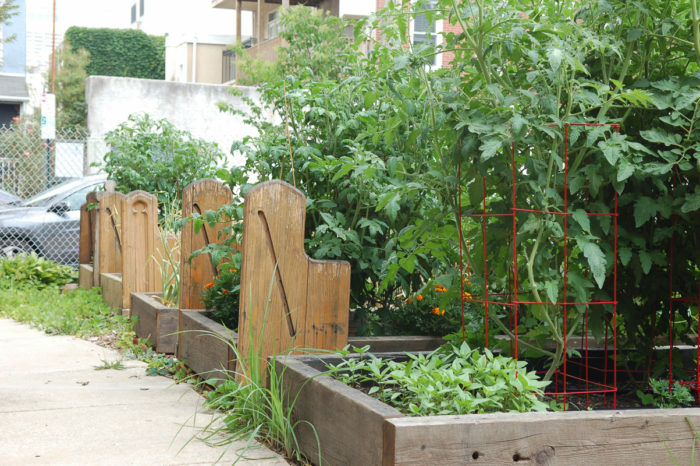 as the numbers of homeless decrease, the trees and gardens will remain for the community, and illustrate how the inner-city can provide fine, fresh produce! Hi - Great story. You might be interested in our organization - Gaining ground in Concord, MA. Adjacent to Thoreau's birth home, we grow about 100,000 lbs of organic produce with the help of volunteers and distribute all for free to local food programs and pantries.